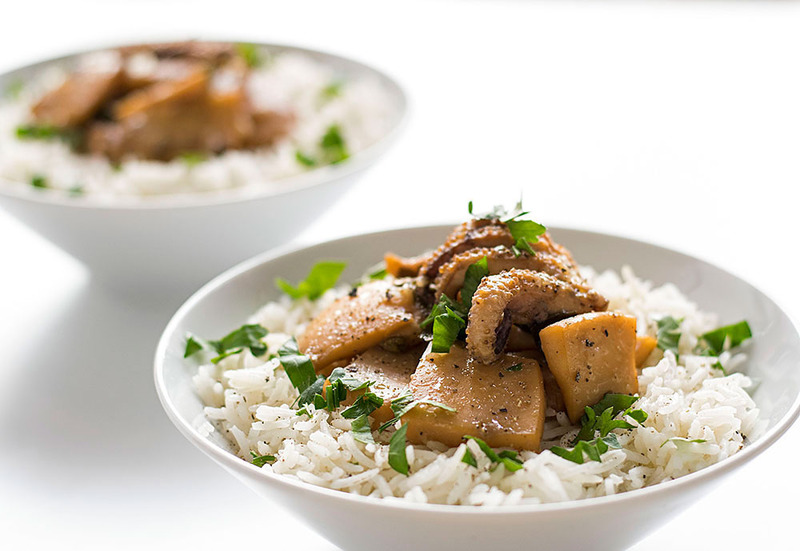 If you haven’t tried cuttlefish stew before, this is the perfect recipe to start with. Very easy and simple, yet really delicious! This dish reminds me a lot of home… Every time I make cuttlefish stew and put a plate on the table, I get the feeling that I’m in my parents’ house, sitting at the dinner table while my mom serves each one of us with excess affection and my father cuts the bread with a big serrated knife. Maybe it’s because this dish represents the genuine Cretan cooking philosophy. During the past years, when my grandma was still young and my mom just a little girl, people in Crete didn’t have a lot of amenities. Life was pretty rough. Women had to walk to the nearest stream to wash their family’s clothes and had to start a fire in order to cook everyday meals (makes you love your kitchen stove a little more, right? ).I’m not even going to mention the lack of fridges and other modern appliances. In addition, access to a lot of goods such as exotic spices, herbs, certain seeds and cereals was somewhat limited. They settled with what they had. So, inevitably, they learned to use all of the available local products to their maximum. They’d use herbs harvested from the nearby mountains, local fruits, fresh meat/seafood and wild greens. I believe that the secret of Cretan cooking is treating your limited ingredients with respect. And by this, I don’t mean talking to them politely :P. I mean that you don’t have to use a lot of different ingredients or an excess number of spices and herbs, trying to create complicated combinations of flavors. Here, magic is in simplicity. A few quality ingredients combined the right way, will enhance each other’s flavor and create an amazing dish. 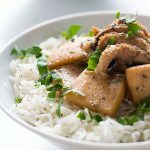 For this cuttlefish stew recipe, some cuttlefish, onions, a little wine and parsley will work wonders! (plus some salt and pepper obviously… please, freshly grated pepper). The low and slow simmering process ensures that you get very tender pieces with a delicious sauce. It’s best served with some fluffy rice, french fries or mashed potatoes. Note that cuttlefish will shrink a lot during cooking. This is normal, since they contain a lot of water. Also, it is safe for the little kids to eat because all of the alcohol is evaporated during cooking. 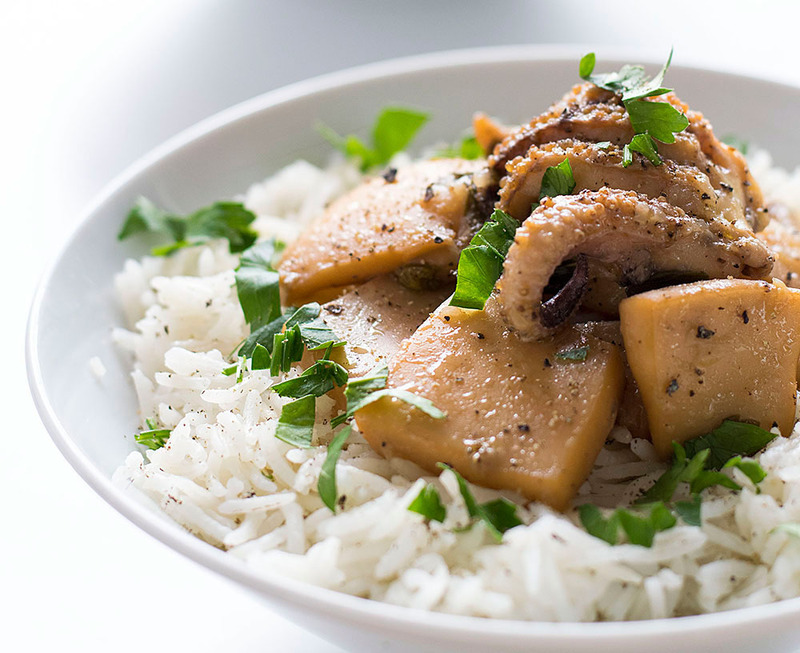 If you haven't tried cuttlefish stew before, this is the perfect recipe to start with. 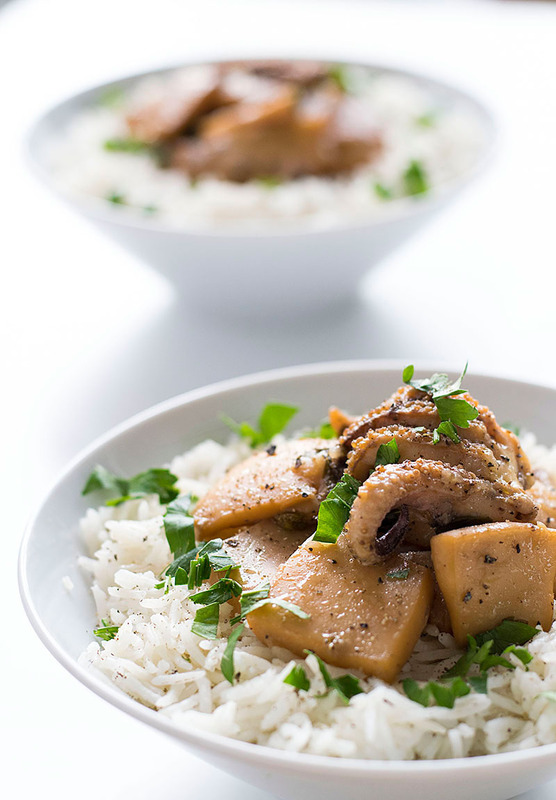 Very easy and simple, yet really delicious! 3 pounds cuttlefish in one and a half inch square pieces approximately. Use the heads whole or cut in half. Rinse and clean the cuttlefish and let dry on a collander. On high heat, saute onion for 1 minute or until translucent. Add the cuttlefish, bay leaf and stir. They will water out. Wait until all of the water is evaporated, and add one cup of wine. Reduce heat to low and simmer covered until tender (about 30-45 minutes). Check from time to time, and if the liquids tend to evaporate completely add a little hot water. Add the rest of the wine, parsley, freshly grated pepper and salt and simmer uncovered for 5-10 more minutes until the alcohol has evaporated and liquids are reduced by half. Turn off the heat and serve. Eat. I’ve eaten this in Crete for years and never without olives added to the stew. Where are the olives? Try it if you get the chance though, you’ll like it!